I’d been craving buffalo sauce for awhile now, and am so glad that craving culminated in this incredible pizza. Everything about this vegan pizza is pure perfection. There are spicy, salty, vinegary, buttery vibrantly orange-colored soy curls. A creamy and tangy homemade ranch dressing. A doughy pizza base that cooks up nice and crisp on bottom with a soft, puffy crust. 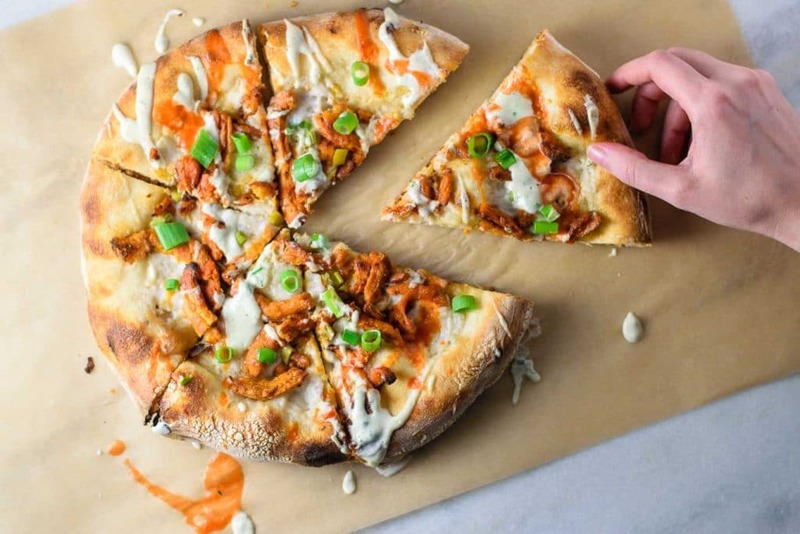 Rich, delicious vegan mozzarella cheese completes the pizza, but don’t forget the scallions in all their oniony glory, and a drizzle of hot sauce to finish. Many tears were shed over how much we enjoyed this pizza (ok, maybe not actually, but emotionally, we were there). So, let’s make a pizza shall we? First, make your pizza dough. Either plan ahead a little and make a homemade pizza dough (here’s my go-to, though this time around I made a sourdough pizza dough), or pick some dough up either from the refrigerated section or freezer section at your local grocery store, or from a local pizza shop. Another thing you can plan ahead is the vegan ranch dressing. It’s cashew based, so if you don’t have a high speed blender you’ll want to soak your cashews for 30 minutes in boiling hot water, or at least 2 hours in cold water to soften them for smoother blended results. Then you’ll blend cashews with a little apple cider vinegar, which provides the sourness needed in the dressing, and all the necessary spices for ranch flavor. You’ll use onion powder, which emphasizes the sweetness of onions, as well as granulated garlic (powdered garlic works too), which is more similar to roasted garlic than fresh in flavor. White pepper is chosen for it’s milder flavor, but used in moderation, as it’s also spicier than black pepper–it delivers some heat without overpowering any other flavors. Dried dill is another necessary component, it’s milder in flavor than fresh, and while I usually won’t even bother with the dried stuff, you won’t get that ranch flavor without it. The last ingredient needed in ranch dressing are chives, which emphasize that delicate, sweet oniony flavor. You can use dried here, but I love to make the onion-flavor pop and fresh works perfectly for that. You’ll stir the minced chives in after blending so as not to turn your dressing green. The dressing makes plenty for the pizza plus a little extra (pre-dinner veggie snack dipper?). It’s best after an hour or more of chilling in the fridge, and even better the next day! 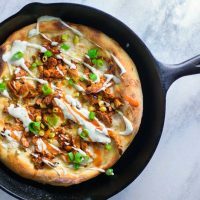 While the oven is preheating and the dough is relaxing, you can whip up your cashew ranch dressing (if you haven’t already) and make your buffalo soy curls. Soy curls are largely flavorless and made from the isolated protein of soybeans (which also makes them a great gluten free protein source). What’s great about them is that they soak up whatever flavor you marinade them with and have a great chewy texture. You may be able to find them in some grocery stores, but I have better luck ordering straight from amazon. They are dried and last for months in the pantry, so I’m always sure to stock up when I’m out. To make the buffalo soy curls, first rehydrate them with boiling hot water then squeeze them dry so they’re ready to soak up buffalo sauce flavor. Then sauté them on a hot skillet with a little oil until they’re browning and develop a nice chewy texture. Pour the prepared buffalo sauce over the soy curls and fry them for another minute or two until they’ve soaked in all the sauce. Set them aside until you’re ready to assemble your pizza, and wash out your skillet, if it’s the same one you’re going to bake a pizza in (more on that later). 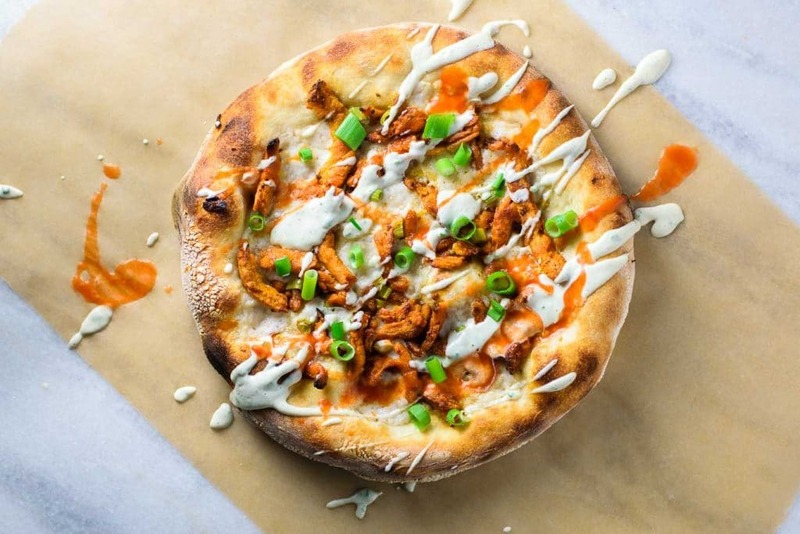 When you’re ready to top your pizza, get everything laid out on the counter: olive oil, crushed garlic, shredded or crumbled vegan mozzarella, buffalo soy curls, sliced scallions (with the white and dark green parts separated), ranch dressing, and some more hot sauce. Shape your pizza dough into a 12″ round and top. First smooth a thin layer of olive oil over the dough, followed by a little crushed garlic. Spread a layer of vegan mozzarella over that (I use about 2 2/3 oz cheese per pizza), then add about 1/3 of the buffalo soy curls to top. Finish off with a sprinkling of the white and light green parts of the sliced scallions. Bake the pizza until the crust is crispy on bottom, you have some dark golden or lightly blackened spots on top, and the cheese is melty. Then finish the hot pizza with a drizzle of ranch dressing and hot sauce, and the sliced scallion greens. Serve with more hot sauce and ranch at the table. I’ve given two ways to bake this pizza in the instructions. The first is in a cast iron skillet and the second is directly on a pizza stone or baking steel. My favorite way to make this particular pizza is to bake it in the cast iron. You can make the dough extra thin on bottom with the additional support and bake it a little longer for a super thin and crispy crust. 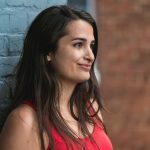 But I only have one 12″ cast iron skillet, and I like to make 3 pizzas at at time (each pizza feeds 1-2 people, which for my small family this means leftovers! ), so I’ll follow up my single cast iron pizza with two baked on my baking steel. This is no mark against my baking steel, as this is typically my preferred baking method, I just really love this particular pizza baked in a cast iron. For the pizzas baked in the cast iron, I’ll go in to cut them with kitchen shears, but you could also remove the pizza from the skillet with a spatula then cut with a knife. Just make sure, no matter which way you’re baking the pizza, don’t use parchment paper in the oven at that high of a heat! This pizza is so delicious, I may have trouble branching out for months. 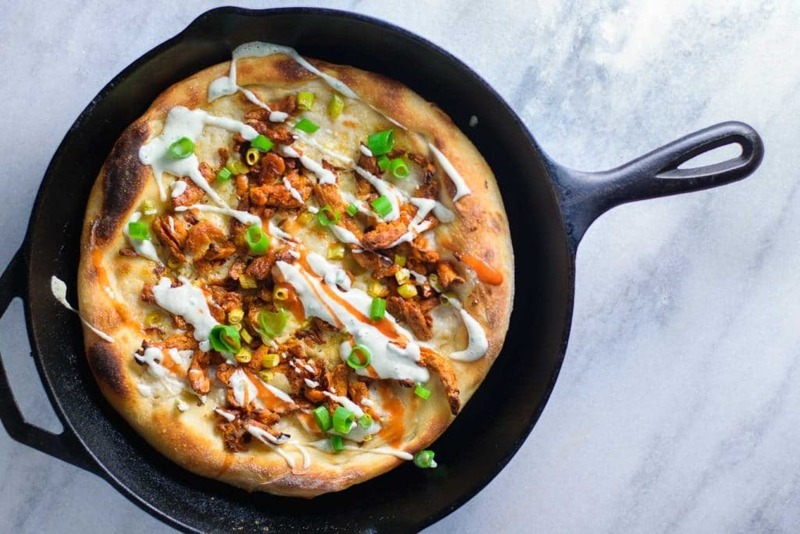 So eat your fill of this buffalo soy curl pizza, friends! I suppose if you want more pizza recipes, I do have many others for you to enjoy already on the blog. Well, as always, please let me know if you have any questions, and let me know if you make this buffalo soy curl pizza. Leave a comment below, and tag your photos @thecuriouschickpea and #thecuriouschickpea on Instagram, or share with me on Facebook. Happy holidays, and happy baking! I used Miyoko’s Kitchen Vegan Mozzarella, but you could use homemade or your preferred store bought vegan mozzarella. For 3 pizzas I use 8 oz of vegan mozzarella. You can substitute seitan for soy curls if you’d like, just cut the seitan into strips (or buy the kind already in that shape) and skip the rehydrating step. Seitan will probably not soak in the buffalo sauce all the way like the soy curls do, but cook it until it thickly coats the seitan. 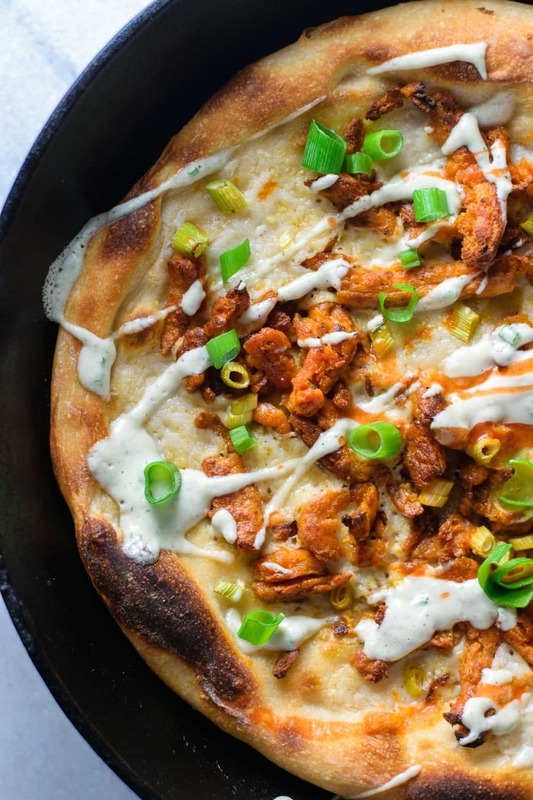 Pizza dough is topped with vegan mozzarella and buffalo fried soy curls, baked, then finished with a homemade cashew ranch dressing, scallions, and extra hot sauce in this delicious vegan buffalo pizza! In a blender combine all the ingredients except the minced fresh chives. Blend until smooth, thick and creamy. Transfer to a container and then stir in the chives. Place in the fridge and let chill until ready to use, thin with water right before using if needed. Place the soy curls in a heat safe bowl, then pour in enough boiling water to cover them. Cover the bowl and set aside to rehydrate the soy curls. Wait at least 15 minutes, then drain them in a strainer before taking 1 fistful of soy curls at a time and squeezing as much water out of them as you can. You may need to wait a few minutes after draining them before they're cool enough to squeeze. In a small mixing bowl whisk together the melted vegan butter, the hot sauce, granulated garlic, and salt to make the buffalo sauce. Set aside. Heat a large nonstick skillet (like cast iron!) over medium heat, add the two teaspoons of oil then the drained soy curls. Fry for 5-7 minutes, stirring occasionally, until the soy curls are lightly browned. Pour the buffalo sauce over the soy curls and cook and for an additional 2-3 minutes until the sauce is absorbed. Taste and add more hot sauce or salt if desired. Remove the soy curls from heat and set aside until you're ready to make your pizza. One hour before you're ready to bake, preheat your oven to 550 ºF, or as hot as it will go. Place a rack 1/3 way down from the top of the oven, and place a baking steel or baking stone on that rack if using. You want the oven to saturate with heat for 1 hour before baking pizza for best results. When the oven is nice and hot, prepare your pizzas. Stretch (don't roll!) 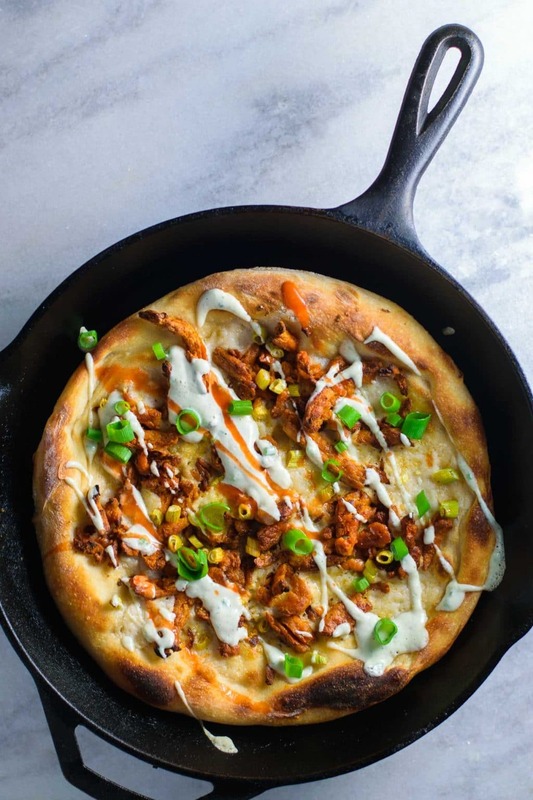 your dough to 12" and place in a lightly oiled large cast iron skillet. Drizzle a little olive oil over the dough and spread it to cover with your fingers. Then sprinkle some minced or crushed garlic over the olive oil. Sprinkle with vegan mozzarella, then cover with about 1/3 of the buffalo soy curls. Lastly add some of the white and light green parts of the scallions. Place the entire cast iron skillet on rack, and bake for 12-15 minutes, or until the crust has darkened and turned dark brown or black in spots. Alternatively you can bake the dough straight on a pizza stone or baking steel, just place the dough on a prepared pizza peel, then top the pizza and slide into the oven on the stone or steel and bake for 8-10 minutes. When the pizza is cooked, remove from oven and drizzle some of the chilled ranch over top and extra hot sauce if desired. Then finish with some of the green parts of the scallions. Slice and enjoy while hot!